Pautzke TV Returns From Trout Fishing – In Virginia! 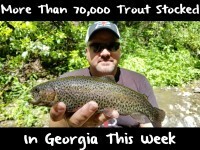 Having been planted in the Northwest for more than 75 years, I too, was shocked a few months back when I booked Pautzke TV co-host Tim Roller and I flights to Charlotte – to trout fish. Roller, who lives in Northern Michigan, wasn’t sold on the idea at the beginning. “Dude, you sure this is going to work? There’s trout all around me up here and you want me to fly down to The South to trout fish?” he asked. For the most part, anglers associate The South with sweet tea, fried food, college football and most likely panfish, bass and catfish. Trout, on the other hand, aren’t the first species that come to mind. Meanwhile, a two-hour drive north of Charlotte on I-77 brings a plethora of stocked trout streams after crossing the North Carolina border. There’s a simple rule; stay west of I-77 after crossing into Virginia and you’re in trout country, at least through Roanoke. The Southern Hospitality was heartwarming. Nevertheless, Mother Nature wasn’t kind on day one of the two-day shoot. Spitting rain, mist, drizzle and blanketing us with fog and surprise thunderstorms, conditions were horrid for filming – and fishing. Ironically, when cameras are present this is common. There’s a myriad of trout streams we had an opportunity to scout, yet chose to fish in the 7,000 person town of Galax, due to larger fish being planted and an opportunity to fish a trophy trout stream. I’m guessing few anglers outside of Virginia have heard of Galax. A few miles north of North Carolina, Galax is sandwiched west of I-77 and east of the New River. Fortunately, we weren’t steered wrong by our friends Robbie Fix and Shane Fox when they told us to meet them for breakfast at County Line Café, a spot only the locals would know, they said. It’s one of the few places I’ve seen breakfast specials for less than $3. And, let’s not forget County Line’s forte: buckwheat pancakes covered in gravy. The food was filling. Nonetheless, we came to the Old Fiddler’s Capitol of America to catch trout. Slurping down grease was a perk. After chugging more sweet tea we drove to Crooked Creek where stocked rainbows and high, muddy water awaited. Unfortunately, day one wasn’t the dream outing we expected. Strong early morning thunderstorms pushed the creek high, drew mud from the banks and reduced visibility, while also dispersing the planted trout. 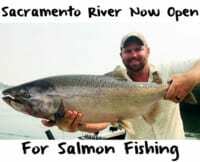 Still, we fished hard, drifting Garlic Salmon Egg, Atomic Garlic and Feed Pellet Brown Pautzke FireBait and Orange Deluxe, Yellow Jacket and Gold Label Balls O Fire salmon eggs into holes. To some, the 20-trout we caught would have been a banner day, but none breached 14 inches. We weren’t thrilled and hoped the weather cooperated on day two. If the stream cleared even a tad we’d be set. And, if not, at least The Smokehouse’s BBQ in downtown Galax didn’t disappoint. Try the hush puppies, apple fritters and corn nuggets, before scarfing down Southern style BBQ. It’s worth an hour break from catching trout. Sun and clearer water dominated day two, as did bigger fish. 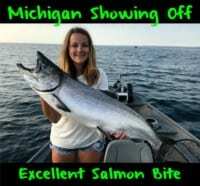 As you’ll see soon on Pautzke TV, in a mere two hours drifting Orange Deluxe and Yellow Jacket eggs, exclusively, we caught a half-dozen trout to four pounds and a handful of smaller 12-inch bows. And, most importantly, we proved the Blue Ridge Mountains and their Virginia rainbow trout do exist in large numbers and chew on FireBait and Balls O Fire eggs just like they do out West. Editor’s Note: Chris Shaffer is the Director of Operations at Pautzke Bait Company. He recommends a large Bojangles sweet tea and a Cinnamon Pecan Twist before heading down to the stream. Co-host Tim Roller chooses to go big, instead, demolishing five drumsticks, french fries and a Bo-Berry Biscuit as a snack.